Written on February 28, 2006 by Kevin. A quarter of a century. As of yesterday, that is now how old I am. Does it seem old? No not really. I still feel like I'm 12 years old and ready to have a good time. Of course that is only when I'm not thinking like an adult and having to pay the bills and make sure the house is in order. My birthday weekend went well. We took a short trip to a great sub shop called Cheba Hut. This was a place that I used to get lunch at years ago and have been craving it ever since. These are not your normal Subway or Blimpie subs, they are great tasting unique toasted subs. Definitely a favorite in my book. Was it some gourmet birthday dinner? No, but it was wonderful. So what did I get for gifts you may be wondering (or not wondering)? Well, my family got me some gift cards and my wife's father got me the Karate Kid movies box set. Talk about a sweet gift. My wife knows me well and picked me up a Goonie t shirt. Another great gift. To wrap up my birthday, I took the day off and ran some errands. Errands that included taking Rylan to the pediatrician for his checkup. He checked out great. The other errand was going to the dentist and getting a checkup and cleaning. I'll admit, I haven't been to the dentist in a very long time and I paid for it. I now need to schedule an appointment for a root canal and multiple cavity fillings. Damn me for never taking the time to go see the dentist. I am anxious to see how Rylan and my wife celebrate my birthday next year. I don't know how they can top this year though. A Goonies t shirt and a treasure chest cake, you can't beat that! Written on February 24, 2006 by Rylan & Kaitlyn. Let me tell ya, this tummy business is hard work. When I was a wee little lad and mom or dad tried to put me on my stomach, I would just fuss and bury my head into the mattress. I preferred to either be on my back or being held, whats wrong with that? Now that I have gotten older, I learned how to roll onto my stomach and then back onto my back. While mom and dad seem extremely impressed with my new skill, they aren't too happy about it when it comes to sleep time. For the past few nights, I have woken myself up after flipping onto my stomach. While I am much calmer with this position than when I was younger, it still scares me to all of a sudden be there when before I was sleeping happily. I end up forgetting how to roll back over and proceed to cry, waking mom and dad up. Its tough. This coming Monday is my dads birthday so that should be exciting. I know I certainly had fun staring at the candles from my moms cake. 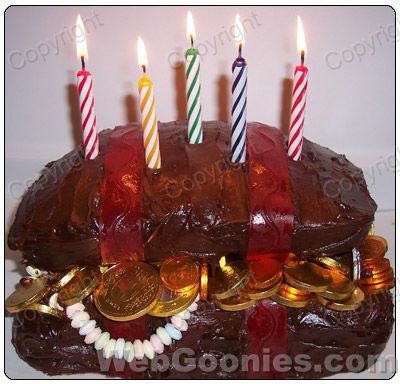 I think mommy is going to make a treasure chest shaped cake to go along with dads pirate themed party favors. It should be interesting. Written on February 23, 2006 by Kevin. It has been a while since I wrote down improvements that my wife and I have seen over the past month or so. As any new parent would say, everyday you learn or your child learns something new. Here is a small list of things that we noticed with Rylan. - grabs for his toys to play with. - has mastered the art of thumb sucking and soothing. - is able to turn onto his belly and then back again. - is able to grab at his toes and munch on them. - is now able to turn his head around in the car to look at me while driving. - pooping has decreased to once a day but that one time will be bad. - is getting closer to being able to sit up. - is very close to being able to say mama (atleast I think so). There are likely so many other things that I just can't remember now. I can understand why, as kids, we think our parents are stupid. I know now that when you become a parent, you lose half of your memory on the spot and it continues to diminish as the weeks go by. Written on February 22, 2006 by Kevin. Early last week, I mentioned that my wife and I found a great little table and chairs for Rylan to use when he gets a bit older. Our idea was to refinish it in a more personalized way. Seeing as my wife loves Disney and because she is the boss, we went with a Disney themed table and chairs. I took the time to sand off the old varnish and just make it as smooth as possible but in the end, we covered the entire thing with paint. It took a bit to figure out exactly how we wanted to paint the table but utimately, we are very happy with the final product. 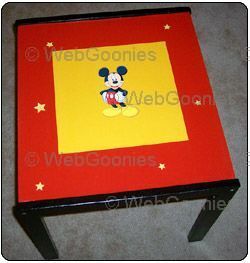 My wife used as 12x12in scrapbook paper to place in the middle of the table with a simple Mickey Mouse sticker on it. Now here comes the fun part. Using Mod Podge, we glued and sealed the paper onto the table. In doing so, we encountered bubbles under the paper, lots of them. This was a challenge but in the end, the other end of a brush and some wax paper did the trick. Two layers of Mod Podge and some varnish sealed this table up and it should now be ready to use. We are debating how to make sure that the surface does not get dinged up and are leaning towards a piece of thin plastic. Any suggestions that can be given would be greatly appreciated. The chairs will be worked on in days to come and we will wrapping up this project soon hopefully. My wife and I are busy working on this project and already have others lined up. Parenting is certainly fun when you get to spend the time and make your child something special and unique. Next up, a wooden tool chest to go with his newly acquired wooden tools that we purchased at yet another garage sale. Written on February 20, 2006 by Kevin. Take a look at the image to your right. Do you see the super cryptic message in it? No I'm not talking about Jesus. I'm talking about Rylan, spelled into the rest of the drawing. Now wasn't that a tough question to start this week? For the record, neither my wife or I are super religious and this site will never turn into a religious blog however soon after Rylan was born, the idea of baptism went through our minds. It took 4 months to finally get it done but yesterday we took Rylan to a local church to get dedicated. The church that my wife had chosen was not a church we had been to together but one that my wife had gone to in the past. Baptisms are in fact called dedications now at this church and after waiting a bit for the church service to get going, it was Rylan's turn to stand up in front of everyone. Of course, 10 minutes prior to going up, Rylan decided he wanted to nap. This church's dedications do not consist of dunking the child's head into water, but rather the pastor and others will come over to pray for our son. They prayed for each of us in fact because we all know how stressful parenting can be. Overall it was a very nice little ceremony with 2 other families getting their children dedicated as well. 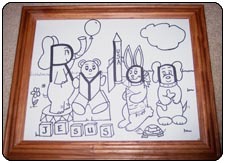 We received a personalized baby bible for Rylan, and the framed picture from above. We were glad that everything went as well as it did prior to the dedications, but Rylan decided to get irritated afterwards resulting in us needing to leave a bit early. On a side note, sitting in the front row of the church and likely anywhere is probably not the best place for a young child. I don't know about other churches, but the church we went too was rocking and rolling with their music and it was quite loud. I'm certainly surprised that Rylan was able to remain calm as long as he did as well as sleep. Written on February 17, 2006 by Rylan & Kaitlyn. Tomorrow I turn 4 months old. Does it seem that long? I certainly don't think so. My mom noticed recently that I have begun crying in different ways now. Dad even mentioned that my screams have gotten louder and higher pitch. In fact, I think they said I sounded like a screaming girl. I was not too happy with that. They must not understand that I am trying to get used to my voice and just exploring things. Speaking of which, I have been really chatty lately and I can break out conversation with myself at any time. It keeps me entertained and calm. My teething is really getting to me lately, its even affecting my eating. I just can't seem to stay focused on eating when my mouth hurts. Mom and dad help a lot with their medicines but what happens when they don't have it around? Its not that fun. Oh boy, did you see me sitting at my new table that daddy found? Its the coolest! Its the perfect size for a little handsome man like myself. I cant wait until I can sit at it by myself. Maybe I will bring girls over to check it out. Now that I think about it, my mom's cousins baby is about 7months old now and she may be coming over today. I am really excited to meet another baby and get the chance to interact with her. No worries everyone, my dad will probably take pictures, he can't seem to keep the camera down. What a goof ball. Trendy little baby shops, yikes. Written on February 16, 2006 by Kevin. We live in a city bordering Phoenix, Arizona and while we certainly are no Hollywood, we certainly have some of the trendy baby shops like they would. Throughout the news, you hear of new celebrity parents buying the best baby clothing and gear from the most trendy of places. This is great for them, but terrible for me. Our downtown district has 2 known baby shops that both sell high price baby items and while they look nice, I cannot find the strength to willingly go into one of those stores. My wife tends to drag me around while pointing out every little item. Now don't get me wrong, I enjoy seeing the excitement on her face when she sees an outfit or toy she would love to get Rylan but her excitement tends to show on my face as dollar signs. 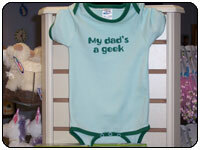 The picture to the right, is clearly the Onesie that my son should be wearing everyday until he outgrows it. Now the question is not whether it is cute, it is. The question is, would you be willing to spend $22 for it? I certainly was not willing to do so, so it stayed on the rack. What I have realized is that while we would have certainly gotten our $22 worth out of it, that does not constitute a good enough reason to purchase it. Furthermore, I have found that high prices does not always equal high quality. Lets rewind 9 months ago, my wife is just beginning to show her pregnant belly so we went out looking for maternity clothing. We come home with a few shirts in hand. My wife proceeds to throw them in the washing machine after reading the labels only to find out that they basically were ruined during the first wash. Granted, the shirts were certainly capable of being worn, they were just not in the same condition they were prior to the wash. I guess this post could be considered a rant. A rant that clothing designers need to work harder at making a quality product and that small trendy shops need to lower their prices for the average Joe, or atleast for me when I walk into their store. Written on February 14, 2006 by Kevin. As mentioned yesterday, my wife and I had the opportunity to take Rylan out garage sale hopping this past weekend. The biggest catch was obviously the children's table but we were able to find some other nice finds as well. We are always on the lookout for good books for Rylan to read when he gets older, and for us to read now to him. While there are many books that are sold at garage sales that are beat up, many others still have a lot of life in them. Its a matter of spending the time to track them down. We were able to find quite a few books this time around and even some for my wife. - Oh, Brother! Somebody's Grumpy! There are toys that all boys will play with in their lives, and the same goes for girls. These toys have withstood the hands of time and are loved by many generations. Well atleast I have memories of playing with little green army men. We picked up a bag of army men and while we are not sure if Rylan will be able to play with them when he gets older, they will work nicely at my desk at work for now. Table Update: Sanding is 66% completed and we took our first attempt at redoing the table top. I say first attempt because it failed. We ended up peeling off all paper that we had glued on and will resurface it another way prior to sealing it. Another update will come in a few days I imagine. Another post to get you through this Monday. Written on February 13, 2006 by Kevin. Here is why we all become parents. This father sets his son up for the scare of his life. I would never do anything like that to Rylan, or would I? I guess I have a few years to ponder that question. Another yard sale find = more fatherly fun. Two months prior to Rylan coming into this world, my wife and I were out garage sale hunting and we came across a wonderful rocking horse. The idea was to restore it by sanding it down and repainting parts of it. Overall, it turned out nicely. Now fast forward to this last weekend, we finally found the strength to get out of bed on a weekend and went hunting once again. The first stop proved worthwhile as we picked up a great kids table for a whoppin $3. The picture below really gives a good idea on how big it is. It has 2 chairs that go with it and overall, is in good shape. Just like the rocking horse, I plan to restore this and even improve on it. Some work will need to be done to make sure its going to be able to hold up to a boy throwing it around. The top of the table currently has some very faded alphabet and numbers displayed on it however that will soon be remedied with some quick work from my wife. She plans on covering the top with some form of Disney design and then sealing it for durability. I will certainly be posting the progress, so keep an eye out for the finished product. It should be nice. Written on February 10, 2006 by Rylan & Kaitlyn. On Saturday, my mom and dad took me to see the Bambi II movie. My dad sure tries hard but he never seems to know where anything is. He ended up getting us lost a little bit but its OK, I still love him. The movie turned out great. There were only parents and other kids there. I think I was the youngest baby though. When the movie was about to start, I got fussy because I needed a changing but after that, I fell asleep in mommy's arms and was out for half of the movie. I hear the beginning of the movie was good though. The second half consisted of mommy and daddy trying to balance watching the movie and keeping me entertained. They did a good job however and I didn't make a peep until the credits kicked in. Overall, it was a success. Btw, mommy and daddy recommend buying the movie as they said it was pretty good. Dad decided not to take me to the Final Destination 3 movie because he didn't want my ears to be damaged or something. I guess some of those movies can get pretty loud for little ears like mine. What other big thing happened this week you ask? Well, daddy finally figured out what can make me laugh pretty often. All that it takes, is for him to laugh at me while pushing air out of his mouth. Boy do I like it. I get all wound up and ready to laugh in no time. Mommy and daddy sure seem to enjoy it as well. Of course, once they whip out the video camera, I stop. I wouldn't want them to have any good video of my secret and illusive laugh. It's top secret, ya know. Written on February 9, 2006 by Kevin. It's that time again in which I don't have the time to make a full post so I round up the best daddy blog posts in recent weeks. If you have any other links that you think should be on the list, feel free to leave a comment. HOW TO: get your toddler to sleep without a fuss - Quite possibly one of the worst things about a toddler I assume, this is a great help. 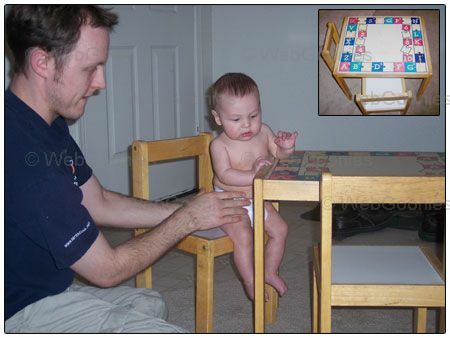 Press'n Seal table mat - Another great tip from the folks at ParentHacks.com. Advice for First-Time Parents - MetroDad throws together some great tips for new parents. I'm certain that we followed quite a few of them. How to soothe a baby? 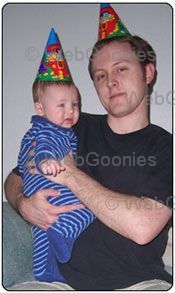 Let me count the ways... - Peldi from PatataMonkey.com gives his advice on how to soothe an infant. Verbal diarrhea at its finest. In search of better board games: saying no to nostalgia - Another great post by AJ at ThingamaBaby in which he lays out how he dislikes American board games. He gives examples of some great kid friendly games. Written on February 8, 2006 by Kevin. How many babies do you see walking around in tie dyed outfits? Likely not too many. Why is this you may ask? 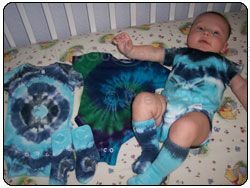 Sure, it could be that tie dyed is a thing of the past or maybe its because parents just don't think to put their kids in it. Whatever the reason, Rylan sure seems to look nice in it. We stopped by a local festival this last weekend and after looking around, we found a tie dyed clothing booth. My wife was quickly attracted to the onesies they were selling. After standing there for minutes trying to decide on which pattern looked the best, we decided on a blue/green effect. We got home and had an idea, why not try to make our own tie dyed outfits for Rylan. After a few nights of preparation including purchasing the necessities and reading up on the steps involved, we tackled the dye the other night. My wife and I had both done minimal tie dying as kids so we were not certain how these would turn out. However, to our surprise, they seemed to turn out great. They each had unique patterns and coloring that seemed to go well together. After a few washes, we threw them on Rylan and enjoyed our success. You need few things to get the job done including a pack of white onesies, some tie tye grade dye (found in the craft section at Walmart) and some rubber bands. There are plenty of resources out on the net that will help out further if you are interested in trying this yourself. We were tossing the idea around of selling these on EBay but it looks like others are already up and not selling. For now, we will take private orders. *Note* The dye powder can be toxic, wear protective gear and keep children away. Written on February 7, 2006 by Kevin. Rylan has no shortage of toys and stuffed animals however my wife has been working on making Rylan a Build-A-Bear since before he was born. Over the weekend, we finally went and decided together on which bear to pick out. 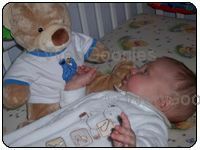 Rylan, of course, helped out and he certainly seemed to like the bear we choose. The choices were slim as they have very few bears that could be considered baby safe. Baby safe as in no buttons or plastic eyes. If Rylan had his way, he would have just taken the bear home as it was. For those who do not know what Build-A-Bear is, you choose which bear or animal body you want and then get it stuffed. Rylan seemed to like it a lot without it being stuffed just yet. When it was time to get it stuff however, Rylan kissed the bears heart and placed it inside. When I say kissed, I should say slobbered all over it. We cleaned the bear up and made our way to the other side of the store to pick out an outfit. Once again, there is a small selection of baby safe clothing to go with the bear. We decided on a cookie monster t shirt and while Rylan has yet to watch Sesame Street, we figured it was the most baby'ish shirt they had. What did we name the bear you may ask? Junior. Why Junior? I'm not really sure but it seemed to be something that my wife and I both had thought of and it seemed to go well. The verdict is that Rylan seems to really like his new bear friend. He grabs it and flings it around his crib and grabs it again. He gives it slobbery kisses and likes to gnaw at its hand. I think it was a success and to make my wife happy, I will admit that she was right again. Ey yi yi. Written on February 6, 2006 by Kevin. There are many things that you come across that seem to work great on a newborn and some that certainly do not. Some of the things that work, you would possibly never think they would work as well as they do. 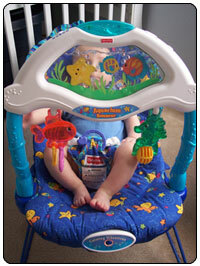 We initially purchased a set of Fisher Price links to help keep toys attached to the car seat. We quickly found out that these are one of Rylan's favorite toys. Our collection has now turned into over 55 different links from different companies. Luckily though, these links all seem to link well enough to work. The Winnie the Pooh links we picked up at Babies-R-Us unfortunately are designed very loosely so they pull apart easily. In fact, all of the links pull apart pretty easily. I imagine this is designed with a reason, as to not injure a child. Of course it may be to annoy the parents as well. Now let me explain why we have so many of these links. Dirt. Because they can sometimes become unlinked, they have a tendency of falling on the ground. Regardless of what the links may have fallen on, or even how long, we decide to put them aside for cleaning, while we just give Rylan a new bunch. The links seem to be working great for hand/mouth coordination as well as helping him with his teething. He will gnaw on these until he drops it and then gives us a lovely cry to let us know what happened. The links in themselves I don't think are really sold as toys, but as links to add other toys too. Fisher Price has a few different toys that link up with these as well as other companies have similar designs. We have a Learn-Along Leap toy that easily attaches to these links and keeps Rylan entertained. A more extensive review of the Learn-Along Leap will be around some day. All in all, I am pleased with these links. They are such a basic item that give a variety of things to do with them. It turns out that Rylan enjoys to teeth on them and just wave them around the most. For us, its a way to keep him entertained while we need to get some chores done. Written on February 3, 2006 by Rylan & Kaitlyn. First off, let me say that teething is no walk in the park. Teething is a royal pain in my gums. Mommy and daddy have been trying to help but I am still fussy at times. The doctor says that teething gels are not good and that we should not try them because the gel can go down my throat and cause me to choke. As I mentioned last week, my grandma came to see me. She came for my mommy's birthday, yay mommy! She was pleasantly surprised on how big I have grown since she had last seen me. 3 months is a long time to go without seeing a baby my age. I have grown into a handsome young man since she last saw me. We all went out to dinner for my mommy's birthday and I went ahead and slept through the evening. I hear the food was great though and I can only wait until I can get my hands on it. Nothing sounds better than gnawing on a big steak right about now. My mom picked up enough money to nearly clear out the video store. Luckily for me and dad, she picked out movies that we all would enjoy. In fact, mommy is now looking for movies that dad used to like as a kid and would maybe want to share with me when I grow up. I think dad mentioned something about Thundercats. I get to try my luck at Bambi II on Saturday so next week I will certainly report on how that went. Hopefully its filled with kids just like me. I enjoy watching the other babies. Written on February 2, 2006 by Kevin. One of the many things that parents try to do with their children are getting them into schedules. This has worked great for us when it comes to bed time and Rylan falls asleep quickly. We tried to get into a bath schedule and hoped to give Rylan a bath each evening before bed but that has since folded and we simply give him a bath when necessary. Schedules can be a beautiful thing. Now that Rylan is over 3 months old, you can certainly see changes in him and he is making his own schedules. Everyday my wife asks me around 3:00pm if I am going to be leaving work on time. The job that I have can sometimes keep me over quite a bit so this is a valid question. In the past, she wanted to know for her own sake but now with Rylan, they both want to know if I will be home on time. My wife has noticed recently that Rylan seems to get extremely fussy when I am not home by 4:20pm each day. If I stop at the grocery store or am running late from work, he sits at home waiting for me. Waiting and crying while my wife tries to soothe him with no luck. Once I get home however, he is back to his peaceful self. Others may see this as something else, but to me, this shows intelligence in Rylan. The fact that he seems to know that I am running behind amazes me.